Why would I paint images of water when I live in Arizona? Many people ask me this question and I always answer that the scarcity of water is why I am compelled to paint it. My subjects are water as abstraction, water with natural forms, the interaction of people and water. Water contained or harnessed in man-made situations is a new branch of my Painting Water series. 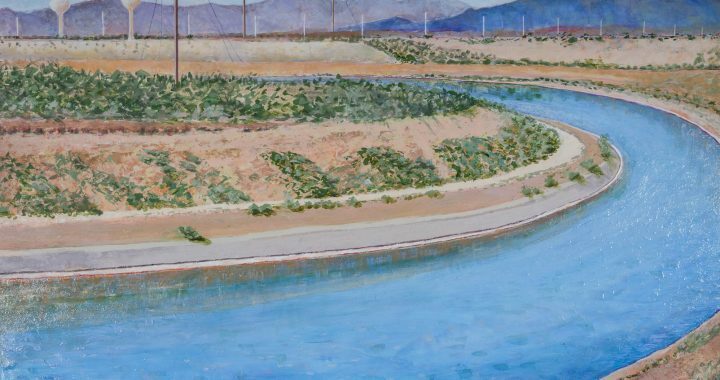 My first experience with painting water was when I lived in Santa Barbara and received an assignment in a painting class to go to the wharf, observe and then choose something to paint on site. The subject most students picked were the sailboats. I, however, looked down and was mesmerized by the reflections on the top of the water, the feeling of impenetrable depth and the changing colors. Did I create a successful painting? No. But the challenge never left me. When I moved to Arizona long ago the thing I missed most about California was the ocean. While growing up in California, it was in a 10-year drought. When a rare rain occurred kids of all ages went outside to play in the puddles in our suburban neighborhood. The scarcity of water wasn’t new to me. What was new was the way in which the desert atmosphere, blue skies and monsoon clouds create wonderful colors and reflections in the water. I’ve painted everything water from puddles to creeks, lakes and canals. 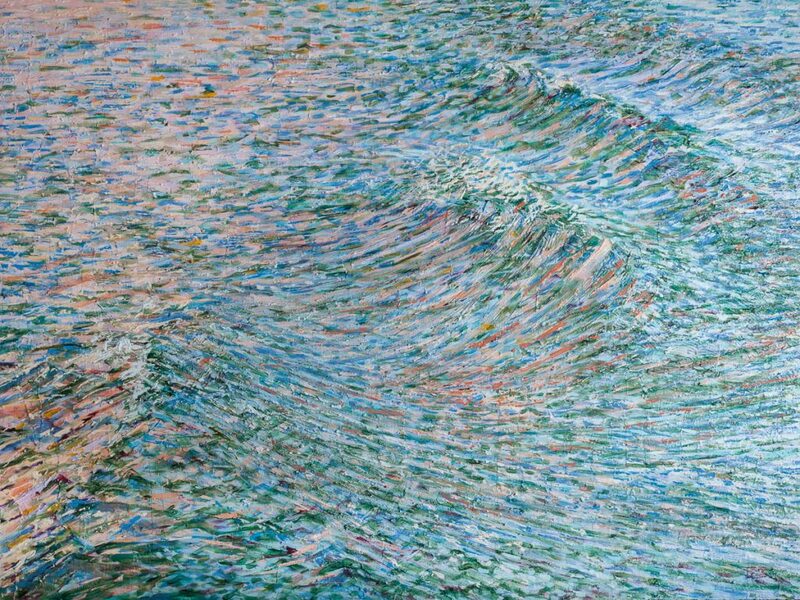 Lake•Boat•Wake, 36”x48”, acrylic on panel, is from the wake I saw at the back of a boat on Lake Powell. Organic forms, rocks, reeds, create a different kind of challenge. In addition. I am capturing the movement in the water. Catalina, 36”x44”, acrylic on canvas. This is from a snapshot I took at Catalina State Park. 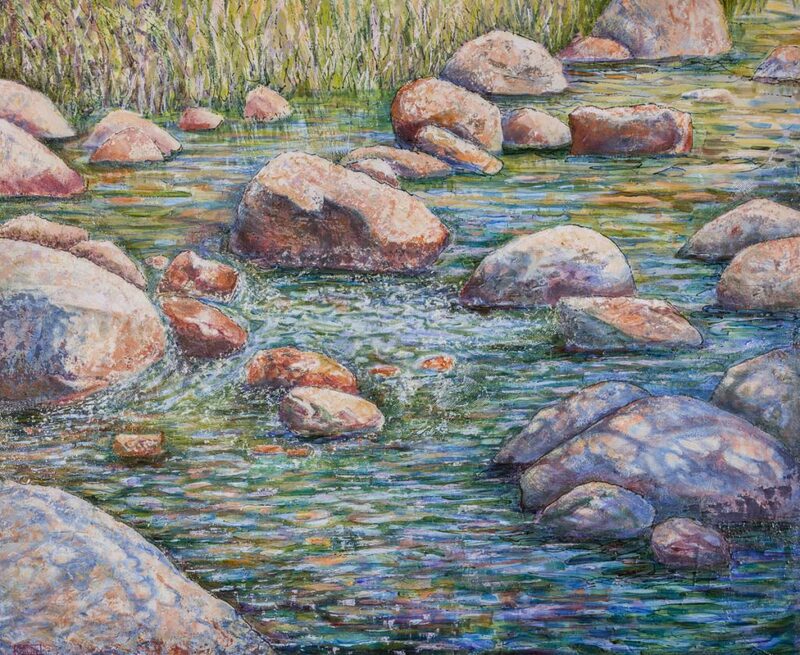 A seasonal stream flows through the wash, which is what I captured in this painting. Beautiful grasses and flowers spring up and wildlife gathers around when the creeks is running. Hikers splash through it. I work from snapshots taken with my iPhone. Once back in my studio in Oracle, after the images are downloaded I pick and choose, crop and print. Then I start to paint, usually working from 2 or 3 reference photographs for each painting and work on 3 or 4 paintings at the same time. I block in large shapes first and then add many layers gradually working into details. I enjoy showing people interacting with water in various situations. Jack and David Attempt to Capture the Beauty, 36”x24”, acrylic on canvas. 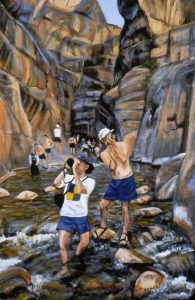 Located at Shinumo Creek along the Colorado River in the Grand Canyon, this painting illustrates my brother-in-law and nephew on a raft trip we took with them, as they madly shot photographs the entire 9 day trip. I never found out if they were happy with these photographs. I took the occasional photograph but spent most of my time looking. The results are a series of paintings using the photos for reference. The Barrier, 36”x48”, acrylic on panel. This shows Glen Canyon Dam on the downriver side, where the Colorado resumes its’ flow. On the other side is Lake Powell, popular recreation area for people throughout Arizona and adjacent states. 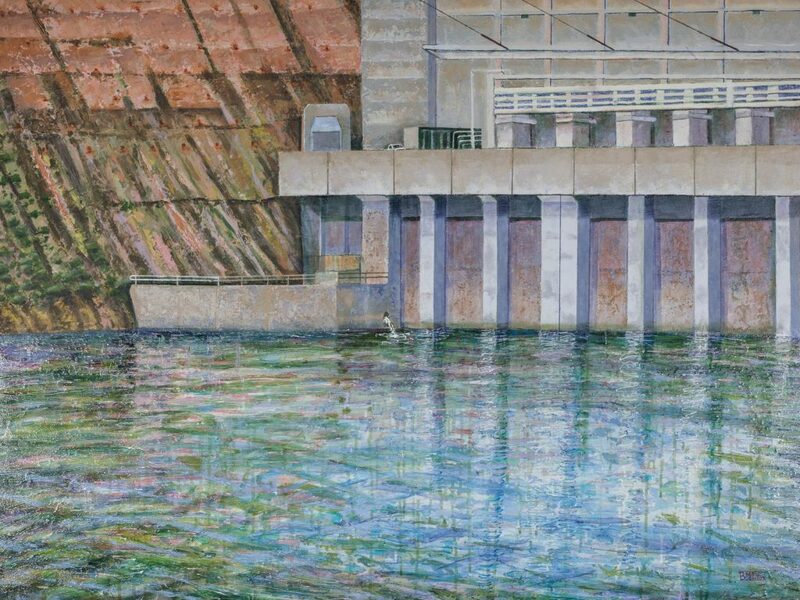 The Dam generates hydroelectric power to the tune of 4 billion kilowatt hours per year and provides water distribution to Colorado, Wyoming, most of New Mexico and Utah as well as to most Arizonans. It was and remains a controversial project because it filled Glen Canyon, a spot with stunning sandstone gorges, not to mention Ancestral Puebloan cliff dwellings destroying the environment of the area, but creating an entirely new place. 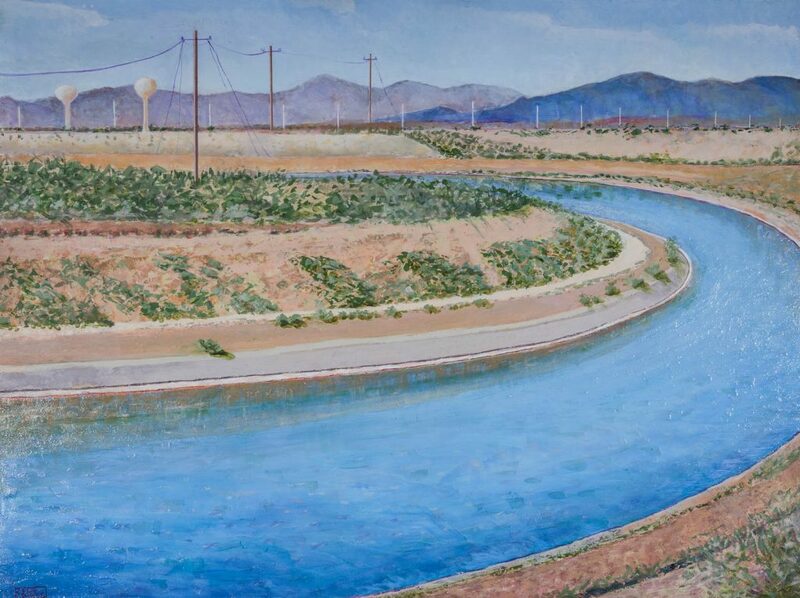 The Contradiction, 36”x48”, acrylic on panel, below, shows one of the many canals in Arizona. The Florence-Casa Grande Canal is part of the San Carlos Irrigation Project. This painting shows the canal just outside of Florence where you can see the otherworldly water tanks in the distance. The color of the water is just as I saw it, really! 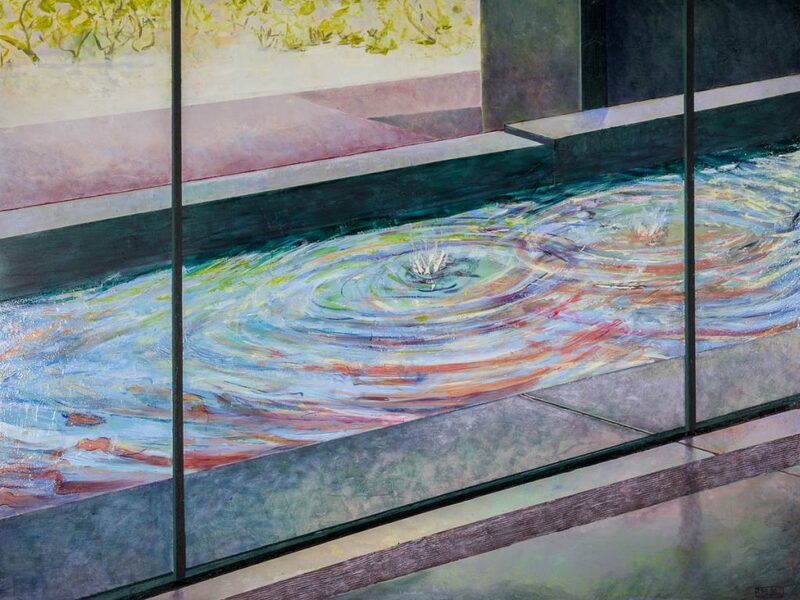 Beauty Contained, 36”x48”, acrylic on panel, the view from inside the lobby at the Phoenix Art Museum looking out the window at the fountain. Not only does this fountain add beauty to the site, it also simulates the sound of running water. A lovely way to get into the right frame of mind to view the art treasures inside. Barbara Kemp Cowlin has lived in Arizona for most of her adult life, in Flagstaff, Phoenix, Ajo and now, Oracle. She has a BFA and MA in art and has shown and been collected in Arizona and around the country. She paints daily in her 650 sq. foot studio steps away from her home in Oracle.